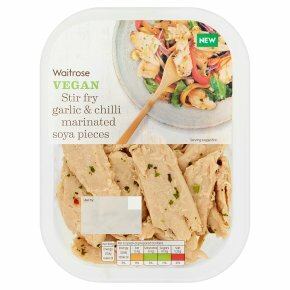 INGREDIENTS: soy protein chunks (92%) (water, soya protein concentrate, sunflower oil, salt, flavouring), rapeseed oil, shallots, garlic, parsley, sherry vinegar, lemon juice, oregano, red chillies, sugar, salt. To Shallow Fry on the Hob from Chilled:…Total Cook Time: 6 - 8 minutes. Preheat 1 tbsp. (15ml) of oil in a frying pan over a low to medium heat. Remove all packaging and place soya pieces in the pan. Cook for 6 - 8 minutes, turning frequently during cooking. Check food is piping hot. Do not reheat once cooled. All cooking appliances vary. This is a guide only.